Precision in the poses, utilizing specific anatomical detail to create correct alignment. An orderly, systematic progression of poses to develop the student’s ability both within a class, and from class to class. The use of props as teaching tools and aids, allowing students of varying abilities to work in the poses with integrity and alignment. Highly developed teaching methodology including the precise use of language, demonstration and teaching of specific points of action in a pose, and individual correction and adjustment of students. A complete approach to physical, mental, emotional and spiritual transformation, bringing the practitioner physical health and vitality, mental clarity and wisdom, and emotional serenity and poise. BKS Iyengar is widely considered to be one of the world’s greatest living yoga masters and, more than any other single person, responsible for the huge popularity of yoga in the West. 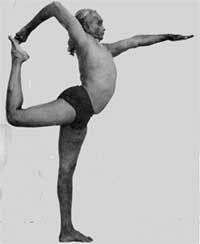 His seminal work Light on Yoga is the most published book on yoga ever written. In 2004, Time Magazine named him as one of the 100 most influential people in the world.